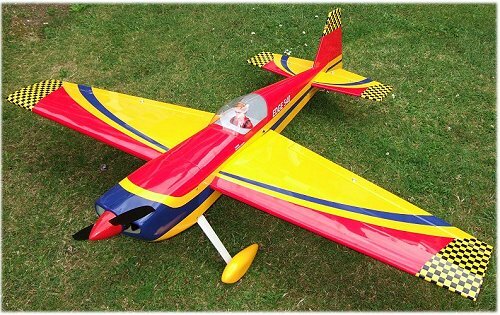 It's an obvious statement to make that rc aerobatic airplanes are designed for, erm, aerobatics! But why are they considered harder to fly than your average 'sport' rc plane or trainer? Well, the reality is that if you've got some radio control flying experience under your hat, aerobatic planes are not really any harder to fly, they're just different. The difficulty comes in flying the aerobatic maneuver that you're trying to pull off, rather than from the plane itself. The obvious difference in an rc aerobatic plane is its design configuration, notably the position of the wing in relation to the fuselage depth, and the wing section. You can see the obvious difference between the NexStar EP rc trainer (shown top) and the Edge 540 rc aerobatic airplane, but what difference does it make in the air? A high wing trainer is designed for one thing - stability. With the wing sitting on top of the fuselage, the airplane becomes 'bottom heavy', if you like, and this results in the plane always wanting to right itself after a turn. A second contributing factor to this self-righting nature of rc trainer airplanes is dihedral, which is the upward "V" angle of the wings when viewed from the front of the plane. 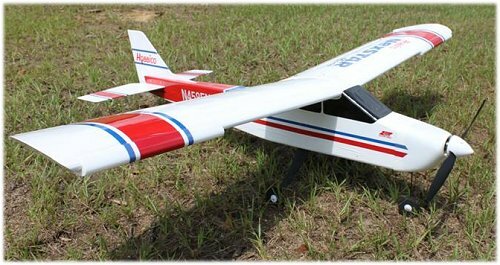 RC aerobatic airplanes are commonly mid-wing i.e. the wing is halfway between top and bottom of the fuselage. This configuration makes them neither top heavy nor bottom heavy, and so they have no tendency to right themselves one way or another. Also, dihedral on rc aerobatic planes is little or none and this flat wing also prevents any unwanted self-righting properties in the plane. So then, the combination of mid-wing and no dihedral results in the airplane staying where you put it, as opposed to a high wing, high dihedral plane wanting to level itself out every time it's forced to turn. As a result, it's much easier to maintain different orientations with an aerobatic plane, because it's not constantly trying to correct itself. Another very important factor in the design of aerobatic airplanes is that of the airfoil (or aerofoil ). The airfoil is the cross-section shape of the wing. A trainer typically has a flat bottom section, or sometimes semi-symmetrical, but a plane designed for aerobatics will be symmetrical. A flat bottom section is very efficient at creating lift, although its drag coefficient is relatively high. But because of its shape, it's only efficient at creating upwards lift when the wing is the right way up. Put the wing upside down and the upwards lift becomes a downward force - not good, and one reason why trainers aren't so great at inverted flying! Now let's compare that inverted action to that of the symmetrical airfoil. Because the top and bottom surfaces are the same shape (i.e. symmetrical) the wing can generate equal upward lift regardless of whether it's the right way up or inverted. So flying an rc aerobatic plane, with a symmetrical wing section, upside down is not a problem, because the lift won't have turned in to a completely downward force. The difference for the pilot is very obvious - a high wing trainer being flown inverted needs lots of down elevator to compensate for the strong down force being generated by the wing, whereas an aerobatic plane being flown inverted does not, generally speaking. The control surfaces of an rc aerobatic airplane are likely to be larger than a trainer or sport plane, and the deflections ('throw') will also be greater to make the control surfaces much more effective. This can make some aerobatic planes more twitchy to fly, but good modern radios commonly have a function called expo (exponential) whereby the pilot can program the amount of control surface deflection to be reduced around central stick movements, yet retain full deflection at greater stick movements. As a result, the plane isn't overly responsive if small stick movements are used. Power is another thing that rc aerobatic airplanes have plenty of, and unlimited vertical performance, although not necessary, is very helpful if you're trying to punch holes in the sky whilst throwing the plane around at speed. But not all aerobatic maneuvers are performed at full power, in fact very few are - it's just that a powerful plane copes with aerobatics a lot better than one with borderline power levels. A 1:1 power to weight ratio is a must for good aerobatic performance (i.e. the engine delivers as much thrust as the weight of the plane). So there you have it, a very basic introduction to things that differentiate rc aerobatic airplanes from non-aerobatic ones. As with everything in the radio control flying hobby, the exact science of aerobatic flying can be a very complex one if you want it to be, and the more you understand about it then the better pilot you'll be. But hopefully this page has given you a fundamental understanding of what helps make an aerobatic plane so good at performing aerobatic maneuvers! Cuban 8 RC airplane aerobatics.